On 22 June 2015, UN Women and UNIDO organized a joint field visit to the Mbolo A ssociation Women Training Center in the Gambia. 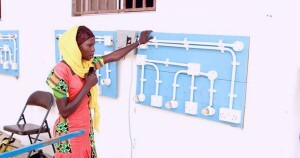 The training center focuses on empowering women and young girls through the use of renewable energy. It was founded in 2010 by the couple Malang, who was born and raised in a village next to the center, and Silvia, native from Barcelona. Fandema, meaning ‘help yourself’ in the local language Mandinka, is the Training Center’s flagship programme. In the words of Malang and Silvia, the vision behind this community development project is “to empower and upgrade the livelihoods of women by strengthening their productive capacities and abilities”. For Mr. Dodou Gaye, UNIDO’s National Project Manager, Fandema shows how renewable energy can address some of the energy access issues in the region, and how greater access to renewable energy can help develop new economic opportunities for women. Fandema targets women and girls from low-income families, and especially those who have dropped out or did not have the chance to attend school when they were younger. The center started with seven students aged between 47 and 65. The training is tailored to the specific needs and levels of the students. During the field visit, the group visited classes on tailoring and sewing, tie and dye, arts and crafts, cookery and catering, information and communication technologies, renewable energy, and painting and welding. The Center has daycare and primary school facilities, a mothers’ club and a shop where all the products made by the students are sold to visitors. Fandema is based on the principle that students have to commit to become trainers of future students. Increased capacity of the Center to train more women. For example, instead of 15 students sharing a computer, they now can have a computer per student. To date the Training Center has transformed the lives of 247 women and girls, and 3,705 women and men have benefited indirectly. The Center served as a case study for West Africa at the Gender Forum in Sierra Leone in 2014, and was recently presented by the Minister of Energy as the best practice for West Africa at the Vienna Energy Forum in June 2015. Silvia and Malang have the ambition to scale up the Fandema programme and intend to replicate the methodology, training curriculum and services in other parts of the country and across Africa. In the near future, they plan to develop partnerships that will allow students to install solar panels and provide maintenance services in villages, and to design and develop environmental-friendly products. A training center for teachers and trainers that offers learning opportunities relevant to the needs of the different communities. According to the Mbolo Training Center’s founders, the Center currently has a waiting list of 250 women and young girls who are eager to learn new skills to improve their livelihoods and financial situations. Written by Yébé Diallo, Empower Women Regional Coordinator for West and Central Africa.